We’ve seen the mass compilation releases of Axe Cop flowing in, this weekend at ECCC 2012 we got word that Axe Cop is setting sights on higher position though and it might not even be planetary. 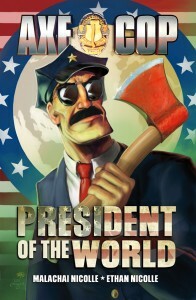 Axe Cop at the peak of power following Bad Guy Earth has only one direction left to go and we’ll see it this summer. As commander of the whole world it’s a tough place for Axe Cop, the bad guys are out of the picture there’s only one frontier left to venture into, space. Yes Axe Cop is taking the fight for justice to space and everyone better watch out. It really is a tale we could only find from such a young mind. There is a key thing to note, this is a pretty noble effort to make it a continuation and not just a sequel comic so expect the same awesome fights, story and other elements that make this a priceless series. For those wondering, you only have to hold out for a few more months, Axe: Cop President of the World #1 heads out on July 25th, 2012 from Dark Horse Comics. We’ll have more details on the book and our early coverage when we get closer to that release. In the meantime, enjoy the poster art for the book.